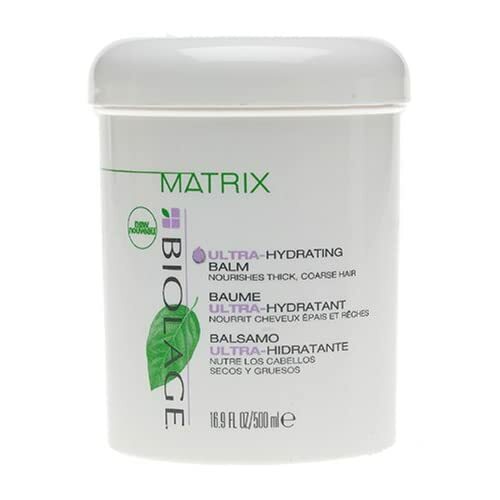 Wish List: Biolage by Matrix Ultra-Hydrating Conditioning Balm - Hairlicious Inc. I've heard amazing raves & reviews about this conditioner over at HT, and I can't help myself, I just gotta try it. Im a sucka for Moisturizing Deep Conditioners. They just have a soft spot in my heart. The ingredients look pretty good IMO. Check out the stats! Product: Biolage Ultra-Hydrating Balm is an essential step in the Biolage Ultra-Hydrating System for very dry, thick, coarse hair. It helps seal the cuticle, lock out humidity and eases away frizz. This is a pure Biolage Botanical Complex of Lemongrass and Wheat Germ Lipids helps condition and smooth. Biolage Ultra-Hydrating System recharges hair with intense hydration, leaving it deeply moisturized while helping to control unwanted volume. Your hair is instantly soft, shiny and manageable. How to use: After shampooing, apply to clean, damp hair. Rinse thoroughly. For more intense moisturizing, wait 1-3 minutes. In case of contact with eyes, rinse immediately. same here, I love me some great moisturizing conditioners! Let us know the results, think I will add it to my wish list. @ Todoni - I'll let you know how it goes. @ Ms.S - The ingredients sounds amazing! I notice that several moisturizing deep codnitioners have the same ingredients as this conditioner. Its really hard to decipher what is instant from whats a deep conditioner. I know it says leave on for 1-3 mintues, but I believe this can be used with heat for 20-30mins. I have this stuff and it is fabulous! I was actually introduced to it by a white woman with silky soft bleach blonde hair. She purchased one for me and I thought to myself, "why did you just waste your money, don't you see my hair don't look nothing like yours?" But when I tried it, I was amazed at the slip and moisture levels of my hair. That was years ago and I still replenish this product whenever I run out. Hi Sunshyne, You will love love love this conditioner lol :o), I use it weekly , for a long DC. It smells divine, and leaves your hair feeling nourished . Its a lovely consistancy and yet its light on your strands. This is a staple product for me. I used it lastweek with my steamer . Lovley results. Thanks N_vizion & Dee for your input. Im so excited to try it. Im longing for a mid-week deep conditioner.